Fuji X100 April Fools joke. There were some good April Fools day jokes. There was a nice Google gmail one about accessing your gmail account by making body movements at your mobile phone and one advertising a new Apple "iCam." 43rumors announced Canon were joining MFT. My favourite however was a Dpreview thread that announced the Fuji X100 could surpass the quality of a Leica M9 by using a special interpolation method, which was an anagram of April Fools. I was going to put a link to it but Dpreview seem to have removed it. I guess the idea of April fools jokes is that they exist for one day only so thats probably as it should be. I imagine that some of the posters on that thread are probably very grateful for that! The "X100" shot was in fact taken on a Phase One Medium format digital back and faked so that it had the exif data of a Fuji X100. It was fascinating to see how people believed it. There were also Leica fans saying no its not true, the M9 is better, when from the faked samples it was quite clear that the "X100" images were sharper and had more resolution. The whole thing was very well done, though it was pretty obvious that the image samples were faked. Regarding the X100, even though I was not very impressed by the construction of the camera, I was very impressed indeed by the quality that its raw files produced. I have in fact got one on order. I was interested in the comments of Michael Reichmann at Luminous Landscape. "I have just started a two week-long field test of the Fujifilm Finepix X100, currently the hottest new camera, and one that is in very short supply world wide. Today's Home Page photograph was taken with it just this morning, my first day out shooting with the camera. I don't know if it was the camera, or simply some good luck, but a two hour walk yielded four portfolio-grade images. Remarkable. How is the camera? First impressions are that image quality is spectacular, including the lens and the sensor. The user interface at first appears to be ideal, with traditional manual controls for exposure. But, once you have to use the rear control wheel and menus the cursing starts. My review will appear here in about two weeks, after my drive back to Toronto from Mexico. I plan on shooting extensively with the X100 along the way. 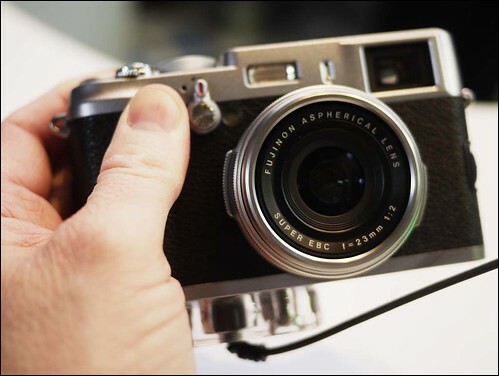 Some interface issues notwithstanding, the X100 looks like a winner." As regular readers here will know I have a lot of time for Mr. Reichmann as we seem to have similar tastes in photographic equipment, and use it for shooting in similar situations. However the sentence "But, once you have to use the rear control wheel and menus the cursing starts." is a bit worrying.